Because our appliances like air pots and microwaves are old and it’s almost 6 years old my hubby wants to buy new. And I think we should replace it, my hubby just borrows the credit card of his sister and makes the best selection of airpots and microwaves. The cost of air pots is 1,200 pesos only it is a kyowa brand. And the brand name of microwave is GE and cost of 6,000 pesos it is also installment for 6 months. I know that these brands are good and quality. Kitchen appliances are very important at home to constituent of the kitchen. Because the kitchen is being the most used place in the house opens up the option for appliances that cater to a wide range of services. And one of the major cooking apparatus for the kitchen is the cooker. TV appliances is the one most important to our home because you just watching to update about news, issues, showbiz, teleserye and many more. We have a 21 inches TV in our small abode it is almost 10 years, but the picture and sound is good it means there’s no problem about the features. But our home is small my hubby have plan to buy new flat screen TV because today they have a multiple monitor mount stand for the flat screen TV and it is fits to our living room. Aside from that it helps to become wide and easy to clean my house. Well, every time that we went to the mall my hubby dropped by to the appliance center to inquire and to choose the good brand of flat screen TV. When my hubby told me that she wants a microwave, we just bought at SM. 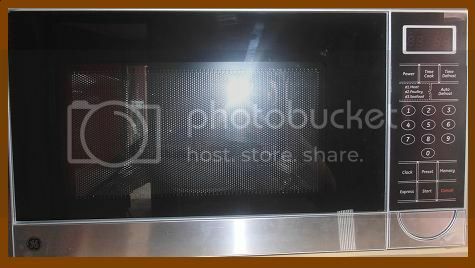 The microwave is GE brand and this is a digital, you can program it how long you want to steam your food. It will stop automatically and your food won’t be over steamed. It becomes easy to me to use the microwave and I love to steam food. Aside from the food I can also heat in 1 cup of water for only 2 minutes. Yes, I do it for coffee :-). I am so glad that we bought a new microwave, now I am so happy. I love my kitchen stuff. Christmas is fast approaching. I’ve seen my neighborhood already set some Christmas decorations in their house. We haven’t but for the past few days I was very busy cleaning our simple abode so I can put Christmas decor as well. I want to put Christmas tree in our entertainment area. So I started cleaning that area first. It’s messy because of our appliances like TV, DVD player, amplifier and other appliances. I need to organize everything and probably hide some of the wires. Anyway, I love music and I have many CD collections. Aside from this music CD, I also have the collection of different DVD. My hubby told me to buy a new dvd cabinets for our DVD player. I think this is the best idea and aside from that it helps our simple abode to become cozy and good-looking.